Following a recent post on kaeshi men, Helton asked for more information on which techniques work for tall people against shorter people and vice versa. One of the best guides to understand which waza work in which situation is Chiba sensei’s book and DVD set “Perfect Master” , where he devotes a whole section to which techniques should be used in which circumstances. If you can get your hands on a copy this explains a lot about kikai or opportunity, whereas most kendo books describe technique in isolation. There are of course some very obvious examples of shikake and oji waza that have a probability of success in different circumstances. Men works for tall people against shorter opponents, dou and kote are more likely to help smaller kenshi against the tall. Tsuki too works for small people, which was regularly demonstrated by Arima sensei of Osaka Police. As we discussed, kaeshi men is difficult against a taller opponent as their hands or shinai get in the way of the target whereas kaeshi dou or nuki dou are much more likely to succeed. Helton points out that at a height of 2 metres suriage men works for him. Strangely enough at my 1m 73 it also works for me, but I think that is because we are sliding up against a downward strike so both shorter and taller people can use it successfully. On the other hand kiri-otoshi is almost impossible against a much taller opponent. Against jodan we have a whole new set of challenges regardless of the respective height of each player. I would guess however that many jodan players are relatively tall. In this case as well as the text-book tsuki, keeping your shinai in hirasegan and threatening kote and switching to men or threating men and switching to hit kote are worthwhile ploys. Kaeshi men too seems to work against jodan regardless of height as the jodan players men is open once he makes his attack. Nito is a nightmare. 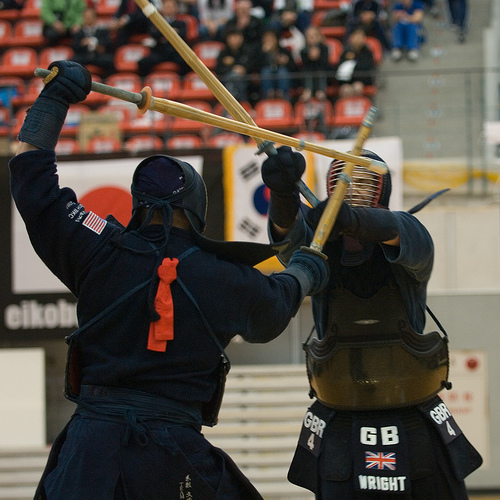 Variations of techniques against jodan are still relevant, but the kodachi is always there to block men attacks. In this case tsuki and dou are the major targets. In all of these situations practise and experimentation are the only way to find what works for you against different opponents, and if you train regularly with the same few people, it is worth visiting other dojo to broaden your selection of partners. I am no longer surprised by beginners who after a few weeks in armour, are bursting to take up nito or jodan. 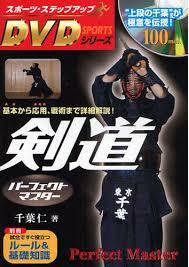 Everyone who starts kendo does so with a vision of the kenshi that they wish to become. Of course having a goal to aim for is totally worthy. 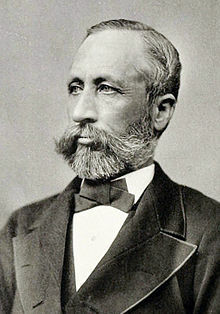 William S. Clark’s parting words to the students of Sapporo Agricultural College “Boys be ambitious”, became common currency in Japan, and are still quoted a hundred and thirty years after he said them. We live in an instant age. Whereas singers and musicians achieved fame after years of learning their trade by gigging in pubs and clubs, todays “superstars” reach their dreams by appearing on talent shows. Clearly this view is slightly coloured by my status as a “grumpy old man”, but as a member of the “me” generation, I am probably as much to blame as is Simon Cowell. To face facts, there are no instant gains in kendo. Skill is built on years of hard training. I have discussed the challenges of building patience into the kendo learning process with a number of my betters; particularly Chiba sensei. His view as a jodan player is that until you can invariably produce accurate waza from chudan with correct ki-ken-tai-itchi you should not move on to the more esoteric aspects of kendo. If you can’t control one sword then you are doubling the difficulty with two and if your feet and hands don’t work together then you will not solve the problem by reversing your foot position when you take jodan. In my humble (and Chiba sensei’s less humble) view, good kendo is built on the foundation of following good instruction and repeatedly practising basic techniques in chudan. The stage at which people should embark on a shiai career follows similar logic. It is admirable to want to test your skill in competition against others, but unless you can do basic techniques correctly, you risk developing bad habits that could spoil your further development. One or two early exposures to competition will probably help confirm your place in the kendo universe, but without a good basis of accurate fundamental kendo, continued training with shiai in mind will harm rather than help your future development. So far it all sounds rather gloomy, but to my mind, the joy in learning kendo is in training for its own sake and when something falls into place then the pleasure of achievement is enormous. Of course when you have assembled your kendo tool-kit then you can go on to become a great shiai player, whether in chudan, jodan or nito. As good old Bill Clark might have said “Boys be ambitious, but give it a bit of time”. I was happily browsing through the new Official Guide for Kendo Instruction; nodding sagely at the explanations of things I knew, when I reached the section on yuko datotsu. Having refereed internationally on many occasions and attended all the regional referee training courses, I like to think that I have a fairly clear idea of what constitutes ippon. My confidence started to waiver a little when I read the description of yuko datotsu for nito, particularly the explanation of ippon for the shoto. Forgive me if I do not give the exact quote, as I am travelling without the book at the moment, but to score with the shoto the daito must be holding down the opponent’s shinai whilst the arm holding the daito (the long one) is fully extended. Now just to clarify this point, it means that the opponent’s shinai is being suppressed at a distance equating to the length of the arm plus a 38 shinai when you strike with the shoto (the little one). Now I am very far from being a nito expert. 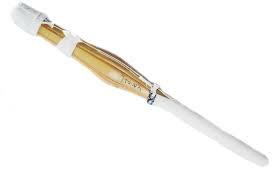 I have never tried it and have no intention to do so, but if I am not missing something, the rule makes it impossible to score with the shoto unless the player has a two metre arm or a telescopic kodachi. I wrote about nito before http://wp.me/stBQt-nito and mentioned that I have never seen ippon given to a kodachi strike. I have also heard a variety of explanations from referee instructors and shinpancho about the difficulty of making yuko datotsu with the kodachi, because nito is “different from mainstream kendo”, but this makes it patently clear that the shoto is not meant for scoring with. The current level of interest in Nito is probably higher than it has been in the past 5 decades. This, I assume, is because of the success enjoyed by Nito players in the USA and Canadian teams in the last World Championships. Many kendoka who have not yet mastered Ito kihon are keen to move up to two swords and a quick look at You Tube shows a disproportionate level of interest in what is a clearly minority aspect of Kendo. Nito is in effect born again. After the post war reintroduction of Kendo, Nito was excluded from high school and university competition in Japan and therefore went into decline. A number of pre-war exponents picked up where they left off and I personally had the privilege of practicing with the late Kasahara sensei of Tokyo, Arai sensei of Itami Airport dojo and Yamamoto sensei of Nishinomiya in Hyogo. Yamamoto sensei was particularly helpful to me in my early days in Japan. As a fluent English speaker, a former Fulbright, Harvard Scholar and a fellow student of Matsumoto Toshio sensei, he took enormous pains to help me understand the historical and philosophical aspects of Kendo. He was a pre-war member of the Tokyo University Kendo bu and a strong campaigner for the reintroduction of Nito. He asked for my support which I gladly gave in publishing some articles in English to help his cause. Let me make it clear. I have never tried to practice Nito, but as you may have gathered, I have great respect for some of the older generation who did it well. The theory with Nito is that the seme is applied with the kodachi and the strike is made with the long sword. 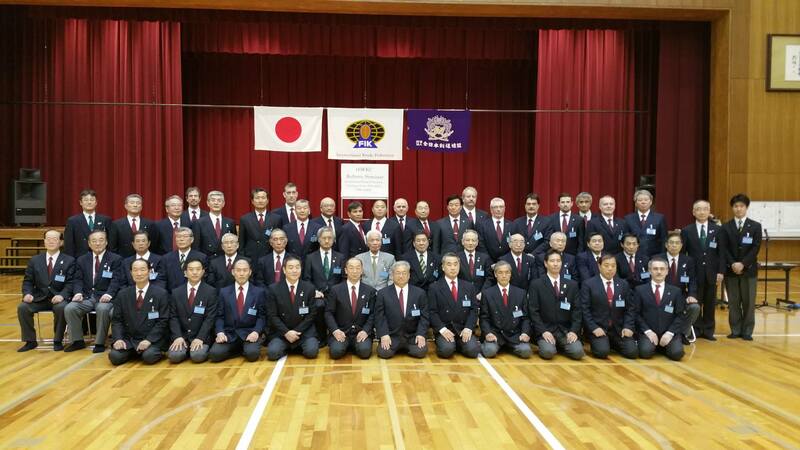 I was told at the recent European referees seminar that ippon is never given to strikes made with the kodachi as Nito is a “special” form of Kendo. Reading between the lines, this means that it has been included against a great deal of debate and that there have been some necessary trade-offs to warrant its reintroduction. As I mentioned, I have been privileged to practice with some of the pre-war greats and as in all encounters with great kendo sensei, I was overwhelmed by the strength of their seme. The kodachi was not used to physically trap the opponent’s shinai but to manifest kizeme to destroy the opponents composure. Of course their are some strong Nito players at the moment. Toda sensei comes to mind immediately. Okamoto-san (I forget his personal name) from Osaka, was an outstanding young Nito player, I hope that he has continued in his path. On the other hand, there are people practicing Nito in a way that I believe, is diminishing kendo. Incorrect tsubazeriai, using physical force to close in and trap the opponent, overly close maai etc. have all recently been used extensively by Nito players in shiai. This may afford an easy win, but does nothing to build on the achievements of the great Nito players that went before.